Location of other vessels (and asteroids). By default no ship commands work in map view (except a few like "x" to cut throttle). If you wish to control your ship while in the map view, click the little grey arrow at the bottom and the navball will pop up. This will restore all controls. While the map view is useful for viewing your current orbital projection, its real power is in the "maneuver" system. This allows you to plan orbits and burns in advance, and make sure you end up exactly where you want to be. The maneuver system is extremely valuable for interescting celestial bodies and for docking events. If you mouse over your current orbital trajectory a small transparent blue icon will appear. Left click to bring up a menu and click on "Add Maneuver". Now you can drag six icons to see what will happen if you were to burn in that direction. If the maneuver is in the wrong place you can delete it by, right clicking in the center and then clicking on the little red "x" that pops up, or you can click and hold the center and move the maneuver's position on the flight path. 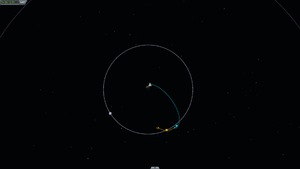 The maneuver will show up next to the navball along with remaining time until the burn, and total remaining delta v. You can plan multiple maneuvers that chain off each other. There are many different orbital maneuvers one can try. 0 - Local to body: Patches are drawn in relation to the current position of each orbiting body. 1 - Local at SOI entry UT: Patches are drawn in relation to the body, but at the time of SOI entry. 2 - Local at SOI exit UT: Same as 1 but at the time of leaving the SOI. 3 - Relative(continuous line mode) (default): Patches are drawn in relation to the current body being orbited. This page was last edited on 23 November 2017, at 12:34.